Ace of Cups tarot card is a symbol of fulfilment, not just emotionally but also spiritually. The Ace of Cups represents how much you give love, support and compassion. It’s not exactly that you will fall in love. Give and accept love on a new level and open your heart to what is around you. The Ace of Cups brings to life a generous, compassionate and empathic component – This is a time of giving – not taking – and offering yourself to a new opportunity to help others. Look for ways in which you can begin to connect with others. Do you have someone to forgive, or do you want to ask for forgiveness? Can you set aside your anger and find peace? Would you like to drop your reserve and let your feelings show? This is a peaceful time in your life so use it and make peace with friends or yourself. The Ace of Cups is also about creative expression. You may be inspired to start a new creative project, take up an art class or two, or even engage in interpretative dance. Pointing in your life where you feel comfortable with who you are and what you feel and you are not afraid to express that part of yourself to others. You see new potential; you are open to new possibilities and stimulating your imagination to allow your talent to unfold. The Ace of Cups often points to fertility. From a very literal point of view, this means that the Ace of Cups can indicate conception, pregnancy or birth. Look to other cards in the reading to confirm that there is indeed a chance of new life (typically the Empress and The High Priestess) On a more metaphorical level, there may be the ‘birth’ of a new idea or a spark of new inspiration. It can represent the beginning of a project in which a great deal of loving and creative energy is invested. This card often means that love is the essence of the situation. It may or may not be romantic love. Look for ways in which you can begin to connect with others. 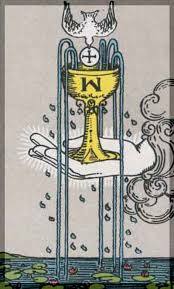 The five streams pouring out of the cup represent the five senses: sight, smell, hearing, taste and touch. Water represents bond and attachment. The hand is all about giving love. A dove holding a wafer or small disc in its mouth descends from above, signifying the incarnation of the spirit in the material world. Below the hand is a sea covered with lotus blossoms, symbolizing the awakening of the human spirit. The cup has an upside down M inscribed on it, reflection of Marie Magdalene. Follow your gut feelings – Let your intuition speak for you – Forgiving and Forgetting.